When I saw the email invitation for a regift swap party come through from Jacquie Ottman in mid-December, I immediately replied with, ‘I’m in!’ I had never been to a regift swap party before so I was intrigued and it sounded like it would be fun. I even began wishing that I would get at least one or 2 gifts I didn’t like during the holidays just to be sure I would have a regift to swap. Some of you might be unfamiliar with the term, but regifting is just what it sounds like – to give someone a gift that you previously received from someone else. You may remember the Seinfeld episode where the term “regifter” was popularized when a label maker is regifted and the original giver (Elaine) finds out. Many people regift by giving gifts they’ve previously received to someone else for a special occasion without the recipient knowing, but I think regift swap parties are becoming more common. Regiftable.com has even declared the Thursday before Christmas ‘National Regifting Day’. I like the idea of knowing all the gifts up for grabs are regifts and no one is trying to hide anything. The even better part of a regift party is hopefully finding a home for something that would otherwise go to waste gathering dust on a shelf in your closet. Our party was after the holidays, which of course made sense, given that the regift bags get refilled over the holidays! As it turned out, I ended up with 2 possibilities to bring with me to Jacquie’s regift swap party: a set of 4 spice rubs and a board game. Both items I would have gladly kept for myself, but I just simply don’t have enough space in my small Manhattan apartment. Jacquie’s regift swap party took place on a cold Sunday in late January. The welcome smell of spiced hot apple cider greeted me when I entered her apartment and met the fellow waste watchers who had arrived before me. 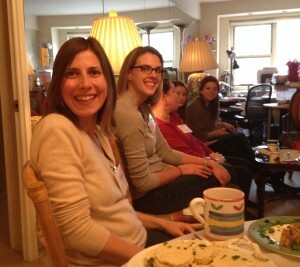 Jacquie had a great spread of tea sandwiches (I heard she saved all the crusts!) and of course, only used real plates and linens. All in all there was a great turnout of about 15 of us and the conversation we shared as everyone trickled in was almost as fun as the regifting swap portion itself! Almost. Once everyone had arrived we set the ground rules for how our regift swap party would take place. We had all brought one (or a few), unwrapped (we all hate waste, after all!) gift(s) and placed them in the center of the room for all to see. In the interest of full disclosure we went around the room and described what we brought so everyone knew their options and any interesting stories behind the items. We settled on selecting regifts one at a time to swap, going in reverse alphabetical order by last name. Like the popular gift exchanges such as White Elephant and Yankee Swap, when it’s your turn to select you have the option of either choosing a ‘new’ gift or stealing one from someone else who has already chosen. The person who is stolen from then has the option of a ‘new’ regift or taking someone else’s (except for the one that was just taken from them). Please, Please Steal My Regift! At first everyone was way too kind and refrained from stealing the gifts they really wanted. But after some encouragement (and lots of apologies) we started to take gifts from each other. Then things got fun. The hot items consisted of a baking stone which we decided would also make a great cheeseboard, a bread basket, and some wildflower seeds. In the end, I think everyone went home with at least one gift they were happy with and we all had a great time in the process. In the end, I think everyone went home with at least one regift they were happy with and we had a great time in the process. I brought home a cookbook, which I haven’t had a chance to use yet, but I love cookbooks and I’m sure I’ll make something from it in the future. To be honest though, I could have gone home from the regift swap with nothing and I would have been just as happy because I thoroughly enjoyed myself at the party and found homes for 2 items I didn’t know what to do with. To Tell or Not to Tell? The Start of a New Regift Swap Party Tradition? Looking back at my first regift swap party made me a little philosophical. Regifting is usually done sub rosa; I have to admit, I didn’t necessarily tell the people who gave me the gifts I brought that I had in turn, regifted them to others. But wouldn’t that be great if we could? What’s your experience with regifts? Have you regifted before, either directly or by swapping at a party? Did you tell the person who gave you the gift that you wound up regifting it? Would you be comfortable telling a friend that you were giving them something that you had received before? Maybe regift swap parties like this one could start to make regifting more socially acceptable. I for one, look forward to participating in more in the future. Alison Sullivan worked at J. Ottman Consulting and helped with the early stages of WeHatetoWaste.com after returning from living in London for 2 years. She now works in business development for a professional services firm in New York City. She became passionate about the environment through her mother’s work at a non-profit environmental education organization when she was growing up. She graduated from Boston College with a Bachelor of Science in Management and a minor in Environmental Studies. Every one who knows me knows if they give me something there is a high chance that I will give it away. I don’t keep a lot. Sometimes I think that is why some people give me things so they don’t have to deal with it. There’s a lot of symbolism, meaning, and emotions tied to gifting. That’s why I got in trouble by my boyfriend when he saw me take a gift to the regift party. If regift parties were more common, perhaps it would make regifting more socially acceptable. Why keep objects cluttered in your room when they would be much happier somewhere else? I’m with both of you. I have a small place and really not that attached to too many ‘things’ but I hate to see things go to waste. So, regifting to me is a great way to make sure that something ‘nice’ gets into the hands of someone who would get use from it. Of course, it would be easier it the emotions weren’t in the picture. One thing that can cut out the emotions — and cut down on the need to regift — if it gifts came with receipts, so it would be easier for people to exchange for something they preferred or at least got the money. How many of us would prefer the money anyway, right? You know the old saying…one person’s junk is another person’s treasure. Unfortunately, the gift I brought to the party was everybody’s junk. I couldn’t unload that Slap Chop and Graty Gourmet Cheese Grater to save my life. I ended up donating them both to the thrift store. Regifting is a brilliant concept and I’m a big fan. Similarly, my friends and I gather from time to time to trade clothes that we no longer wear and make a party of it. Granted, there are some heated disputes over the items that more than one person wants. But, in the end, everyone goes home happy. If you live in New York City, here is a great way to share and trade ‘unwanted’ items with others in your community. Check out http://www.grownyc.org/swap. Allison, for your question on whether to tell or not to tell the person who gave you the gift you ended up regifting, I think it depends on your relationship with that person and the nature of the gift. If you’re close to that person, then he/she may already know that you don’t like or use the gift so there’s probably no harm in telling. On the same hand, if the gift was a trinket of some kind or trivial in nature, again I see no harm in telling. I think regifters may run into trouble if they regift items that have sentimental value or were expensive. I really like this idea. Not only does it sound like a lot of fun (another excuse to have a party or get together), but a great way to increase everyone’s satisfaction. Another variation of this which would be great, would be a group have a get together every 3 or 4 months and rotate a set of items useful to everyone. Everyone gets to use great gifts (especially when they’re still novel and not forgotten) and then trade it for something else several months later. No build up of clutter and everyone gets to try something new. This is my dream post holiday party. Why does this not happen at every office?? This sounds like such a fun party! My friends and I host a White Elephant exchange each year, but I am going to recommend we change the tradition to a regifting format! 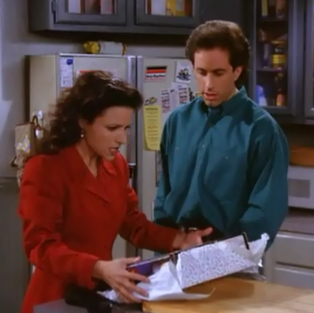 I absolutely love the aforementioned Seinfeld episode, but never thought of regifting as an environmental action. I agree with Jenny’s point about how one person’s trash is another person’s treasure. Waste is unnecessary, for so many people would love to receive the label maker Elaine carefully selected as a thoughtful present. There is no shame in regifting in the name of sustainability! Super creative way of making sustainability accessible and fun! Rather than allowing things to pile up and necessarily imbuing them with weighty sentimental value, it’s great to pass on usable and marketable items to others who many need them. This is just such an amazing idea. I cannot tell you how many gifts I have that just sit in my room never used. There is so much waste in gifting. I know that about half of the things I buy my girlfriends just stay on her floor for months until she remembers she has it. There is always such a stigma with regifting but this could make it a “cool” things to do. Love this! Gift giving is a wonderful gesture, and to pass an “unwanted” gift to someone who will get joy from it is the ultimate thank you to the original gift giver! It takes the guilt out of not wanting something as well. I just hope the person that gave me the gift isn’t at the party. Could be awkward!